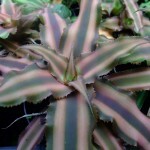 Bromeliads – You can buy plants online by simply clicking “Add” under the photos below and then proceed to the checkout when ready. The Bromeliads (Bromeliaceae) are a family of monocot flowering plants with around 57 genera and over 3,000 known species, native mainly to the tropical Americas, with a few species found in the American subtropics and one in tropical west Africa, Pitcairnia feliciana. They are among the basal families within the Poales and are the only family within the order that has septal nectaries and inferior ovaries. These inferior ovaries characterise the Bromelioideae, a subfamily of the Bromeliaceae. The family includes both epiphytes, such as Spanish moss (Tillandsia usneoides), and terrestrial species, such as the pineapple (Ananas comosus). 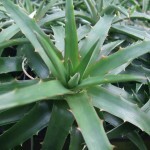 Many bromeliads are able to store water in a structure formed by their tightly-overlapping leaf bases. However, the family is diverse enough to include the tank bromeliads, grey-leaved epiphyte Tillandsia species that gather water only from leaf structures called trichomes, and a large number of desert-dwelling succulents. 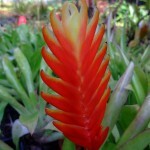 Bromeliads are plants that are adapted to various climates and grow very well in most areas of Australia. They are a very welcome addition to most landscape designs, complimenting the garden in general, including rock garden, small garden ideas, other flowering plants as well as encouraging new and varied landscaping ideas. The foliage come in different shapes, from needle-thin to broad and flat, symmetrical or irregular, spiky or soft. 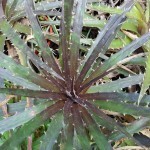 The foliage, which usually grows in a rosette, is widely patterned and colored. Leaf colors range from maroon, through shades of green, to gold. Varieties may have leaves with red, yellow, white and cream variations. Others may be spotted with purple, red, or cream, while others have different colors on the tops and botecies Tillandsia cyanea have a fragrance resembling that of clove spice. A wide variety of organisms takes advantage of the pools of water trapped by bromeliads. A study of 209 plants from the Ecuadorian lowlands identified 11,219 animals, representing more than 300 distinct species, many of which are found only on bromeliads. Examples include some species of ostracods, small salamanders about 2.5 cm (1 in) in length, and tree frogs. Jamaican bromeliads are home to Metopaulias depressus, a reddish-brown crab 2 cm (0.8 in) across, which has evolved social behavior to protect its young from predation by Diceratobasis macrogaster, a species of damselfly whose larvae live in bromeliads. Some bromeliads even form homes for other species of bromeliads. 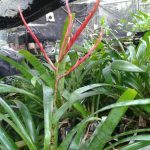 Bromeliads propagation is simple. 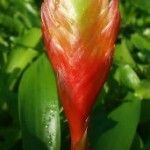 Some bromeliads finish flowering, completely die and need to be propagated from seed. Some bromeliads die, then there should be pups, two or more young plants, at the bottom. Simply remove the soil to reveal where they grow from the base of the plant, and that’s where to make the cut to create a new plant. The potting mix is important. Use an open mix, such as an orchid potting mix, ready made. It’s free draining, so it holds some moisture, but not for too long. They like it moist, but need air around the roots. Don’t pack down, then insert the cutting. These plants have wells which need to be filled with water. The plant needs to be kept moist, in a shady spot and the new plant should be flowering within a year.